Hyperthyroidism is a hormonal disorder where the malfunctioning of your thyroid gland results in the excessive production of thyroxin. It is a condition that’s occurring in all age groups today, making the need for the most effective cure for hyperthyroidism more pressing. Mostly found in people from twenty to forty years of age, the incidences of this disease are about five times more common in women. Grave’s disease is diagnosed the main cause in more than 70% cases of hyperthyroidism, but be it Australia or the entire world, our mechanical lifestyles are playing a great role in making disease like hyperthyroidism widespread as well. 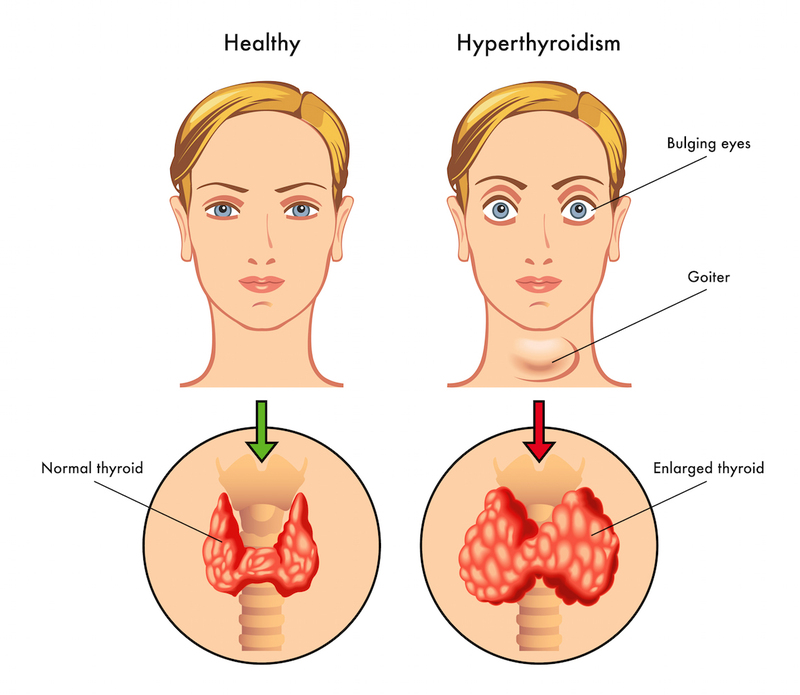 While the conventional treatments like surgeries, anti-thyroid drugs, and beta-blockers can give you second thoughts with the risks and side effects involved, the natural treatment for hyperthyroidism promise you trouble free successful cure. So, when Ayurveda has valuable gifts of hyperthyroidism natural treatment for you, you’ve got nothing to worry about. Ayurveda suggests that hyperthyroidism problems are primarily a result of Pitta Dosha. Controlling all the metabolic reactions in our body, Pitta is also responsible for the functioning of the thyroid gland. An imbalance in the working of thyroid gland caused by the weakened digestion of food stimulates impasse in small channels and systems of your body. Marked with a hot nature, this derangement in the Pitta Dosha results in intolerance for heat and increased sweating. It can also over stimulate your gastric fire, leading to amplification in hunger, increased bowel movements, and even an irregularity in menstruation cycle. The dynamic symptoms like nervousness, stress, agitation, and distracted concentration are caused by a disturbance in the Vata Dosha. Herbal treatment for hyperthyroid aims to cure the conditions by restoring the imbalances of the doshas. Ayurvedic therapies and remedies seek to control all the symptoms right from the root pathology and treat hyperthyroidism by clearing the channels, restoring the secretion and circulation of thyroxin, and revitalizing the body energies with of the body with herbs and lifestyle changes. Here are some of the herbs that offer you a remarkable cure for hyperthyroidism with their wonderful medicinal and healing benefits. Discuss today with the best ayurvedic doctors of Melbourne, Australia to find which herbal blend is most suitable to cure Hyperthyroidism as per as your unique Ayurvedic Body Type. The cooling potency (virya) of kanchanara provides matchless relieve in thyroid complications with its special effect of pitta and kapha dosha. It offers relief in hyperthyroidism by helping T4 convert into T3 without increasing the TSH secretion. Useful in treating psychiatric troubles and gastric disorders, the cold potency (virya) of this herb is known for balancing all doshas, but shows incredible results on deranged pitta. Its anti-stress benefits are unbeatable in treating secondary hyperthyroidism. A fabulous brain tonic from Ayurveda, it’s matchless in calming emotions, improving alertness, supporting concentration, and helping you get restful sleep. It’s cooling potency (virya) balances the pitta and cures hyperthyroidism by unblocking the circulatory, nervous, and digestive channels. Brahmi is an Indian ayurvedic herb, which is metabolic stimulant and nootropic in nature. So it is very effective for the controlling of neuro-endocrine disorders and metabolic disorders naturally. Brahmi has the property of thyroid stimulant, hence study shows increase in thyroxin concentration with the use of Brahmi. A wonderful Ayurvedic herb, Guggulu has a hot potency, bitter and pungent taste, and is counted among the best cures for vata dosha. Containing resin, gum, and volatile oils, it’s taken in different ways and helps in improving the functioning of thyroid. A mineral deposit of humic composition, shilajit is one of the most effective natural remedies for hyperthyroidism. It builds up your strength, promotes the effective metabolism, remedies tissue degeneration, and promise you good health with its high nutritional benefits. A part of the dashamoola, the sweet taste and cool potency (virya) of gokshura are known to balance all the tridoshas with perfection. A natural diuretic, it’s very helpful in the treatment of hyperthyroidism as it improves your immunity, helps in digestion, detoxifies and cleanses, and fights the fire of your body. Diuretic in effect, it revives your body system with punarnavine as its main alkaloid. Hot in action, punarnava is considered a boon for mending digestion, building stamina, restoring health, and soothing the inflammation and numbness of hyperthyroidism. Panchkarma Detox is one of the best natural cures for overactive thyroid. It is an Ayurvedic cure of hyperthyroid that uses a combination of different therapies to provide you comfort from hyperthyroidism by purifying and detoxifying your body. With Panchakarma detox ayurveda aims to cure your condition from the very root cause by removing all the toxins from your body and restoring the balance to all the doshas. The toxins in your body are the causes of stress and illness, their elimination ensures you a complete wellness from inside out. When it comes to the question of how to cure thyroid, you should take expert assistance only from the best like Ayurvedic treatment of Thyroid in Melbourne Australia. It is a Pure Herbal Ayurved Clinic | Spa, which offers you the finest natural holistic care with their best herbal ayurvedic treatments. When you’ve a condition like hyperthyroidism or hyper active thyroid, it requires complete attention and it’s best to get it treated earliest. With the matchlessly skilled and thoroughly experienced specialists like Dr. Gurnam Saini at your service, you can find relief from the condition, making the most of the helpful and harmless Ayurvedic treatments without worrying about anything. Hyperthyroidism is a condition caused by aggravated Pitta and Vata Dosha, and if you wish to cure it the right way, it’s very important to understand that your lifestyle can play a decisive role in ensuring you long term relief. All you need to take care of are slight changes in your everyday routine along with some home remedies for thyroid and it can assure you the perfect hyperthyroidism natural treatment. Fruits like peaches, melons, dates, banana, and walnuts can help you calm the Pitta and Vata Dosha. Including regular intakes of milk products in your food plans can prove really helpful. You can successfully and effortlessly cure the agitation of the Doshas at a spiritual level by practicing yoga, meditation, and pranayama breathing excersice. Just bring about these small lifestyle changes and you’ll also find internal peace and a robust health along with relief from hyperthyroidism. Contact us today to take the complete ayurvedic consultation and find out the best life-style, food, fruits, herbs, ayurvedic natural medicine, panchakarma detox etc. to cure hyperthyroidisms or hyperactive thyroid.